The beautiful Pansea Beach is an inspirational setting for business conferences or for any events. 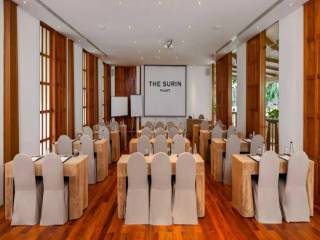 Both versatile meeting rooms at The Surin Phuket enjoy tropical views with an abundance of natural light that will stimulate and energise delegates. The stately library is ideal for board meetings while The Surin Room can accommodate up to 80 guests in a theatre-style setting. The dedicated team to ensure a seamless experience will handle the audiovisual equipment and catering needs.